Why to have a private pARTy? ​WELL FIRST OFF, IT'S CHEAPER!!! Why is it cheaper?!? I COME TO YOU!!! There are no studio, rental or space fees. 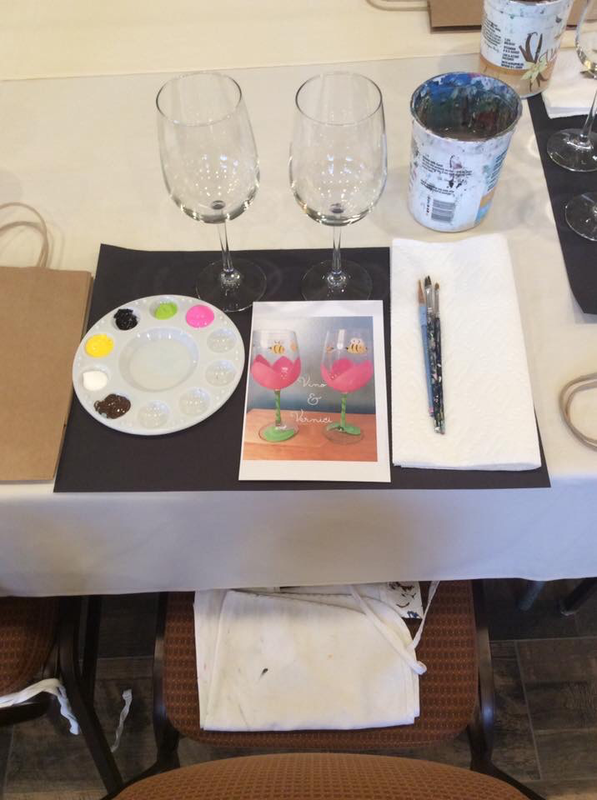 Once you pick and secure a date, you get to choose the painting (canvas, wine glass, wine bottle, canvas bag) for your party from any of our masterpieces. A link to the different art samples will be emailed to you. We provide all of the art supplies, aprons, easels and corkscrews for your use. All we need from you are the tables and a water source for us to fill up our water containers. No set up, no clean up – just show up and leave the entertainment to us!!! Includes paint , paint brushes, palettes, paper towels, smocks, easels and one art material of your choice. What type of art can you create? Can I choose any design? Yes! You may choose from any design or one of your own if you have something specific in mind you would like to paint! How far in advance do I need to book a party? The earlier you book a party, the better chance of our availability. The recommended time to book a party is approximately 3-4 weeks prior to the desired date. The final count of the number of guests and crafts should be provided one week before the party in order to ensure all materials are available (some unique crafts such as wine bottle painting may require a final count 2-3 weeks in advance). Deposits and Payments: Starting January of 2019, we will require a non-refundable $50 deposit to reserve the date and time. This deposit will then be used the night of the private party to cover the cost of your ticket. The remaining $25 will be refunded to your card after the party is held. Please note, the refund may take 1-2 business days to show up in your account. Guests have two options for payment; Your guests register and pay in advance online ​or you may pay in advance and have them pay you back.. Pre-payment is required. Please remember that ALL guests attending need to be pre-registered and paid in order to paint. What is the distance you travel? We travel up to an hour radius from Brockport, NY, We are happy to come to farther distances; however, the minimum number will increase to compensate for the additional gas and time driving. Schedule Your Party with Vino & Vernici Now! ﻿Want to have a great party at home, at the park, or any other location but don't want the hassle? Let us bring the party to your chosen location! All you need to provide is the location, tables and a water source to fill up water buckets and for me to clean up. 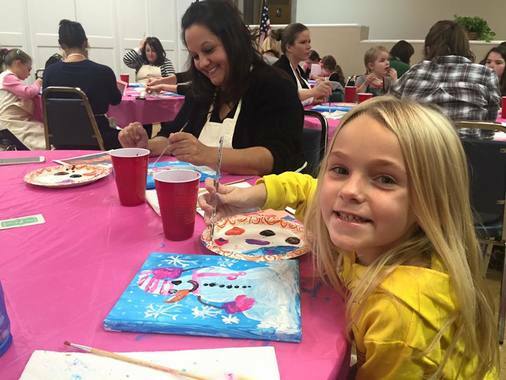 There is a wide great variety of arts and crafts and is the newest creative and fun entertainment for children and young teens. Each artist can make﻿ th﻿eir own take-home party favors using their imagination and creativity while working with numerous craft materials provided by Miss Salatino. Includes paint (acrylic), paint brushes, palettes, paper towels, smocks, easels and one craft of your choice. ​How far in advance do I need to book a party? The earlier you book a party, the better chance of our availability. The recommended time to book a party is approximately 2-3 weeks prior to the desired date. The final count of the number of kids and crafts should be provided one week before the party in order to ensure all materials are available (some unique crafts such as umbrella painting may require a final count 2-3 weeks in advance). What happens if our numbers drop after we have given our final count? Unfortunately, since the requested crafts are specific to your respective party, you will be charged for the entire amount even if all materials are not used. Unused materials are yours to keep (such as the canvases, bags, etc); however, all materials such as paint, brushes and palettes will remain with Ms. Salatino. Is the paint used washable? Normally acrylic paint is NOT washable; however, the paint can be removed if Murphy's Oil Soap is applied to the stain that night.